Scaletron Industries, Ltd., a manufacturer of corrosion resistant digital and mechanical scales, has introduced the Model 4042-63 IBC-WE IBC Spill Containment Scale with Weatherproof Enclosure for use in the industrial and chemical process industries. The Scaletron Model 4042-63 IBC-WE IBC Spill Containment Scale with Weatherproof Enclosure is designed for use in the industrial and chemical process industries. "This unit has been designed with maximum corrosion resistance and was specifically built for outdoor use. The enclosure will handle large IBCs and with its rugged design will withstand most weather conditions." Scaletron Industries, Ltd., a manufacturer of corrosion resistant digital and mechanical scales, has introduced the Model 4042-63 IBC-WE IBC Spill Containment Scale with Weatherproof Enclosure for use in the industrial and chemical process industries. The scale accuracy is to within ±0.1% to 0.5% and the enclosure provides safe, secure protection of outdoor-stored IBC totes. The EPA compliant unit also prevents unauthorized access to the IBC tote. The Model 4042-63 IBC-WE scale weighs and stores an IBC tank with maximum dimensions of 52" x 52" x 61". The enclosure meets EPA Container Storage Regulation 40 CFR 264.175 and Storm Water Management Regulations - NPDES, 40 CFR 122.26. Additionally, the Scaletron scale meets secondary spill containment requirements as established by the EPA, OSHA, and other agencies with a spill containment basin capable of holding up to 360 gallons. "This unit has been designed with maximum corrosion resistance and was specifically built for outdoor use," said Edward Dougherty, president of Scaletron Industries, LTD. "The enclosure will handle large IBCs and with its rugged design will withstand most weather conditions." Dougherty said that the enclosure is made from a durable weatherproof polyethylene which eliminates the potential for rust and corrosion. A four load cell design enables IBC totes to be placed anywhere on the containment platform without requiring platform leveling. Load cells are mounted outside of spill containment basin to eliminate damage due to chemical spills and splashes which are safely contained in the basin. To safeguard scale electronics against splash and spill damage, the indicator and all components are housed in a NEMA 4X, UL approved enclosure to provide protection from corrosive chemicals. Gross weighing capacity is 0-8500 lbs. (3855 kgs). An LCD readout accurately displays net weight of the IBC content. Output signal is 4-20 mA -- scale or loop powered -- and the standard indicator is a 3-1/2 digit display designed with easy readability to 1 lb. (kg), 0.1lb (kg). Additionally, three other indicator options are available: a 4-1/2 digit display with 4-20 mA output -- scale or loop powered -- and two low level REED relay contacts; a 5 digit display (Model 1020) with loop powered 4-20 mA output and two adjustable set points per channel (2 channels); and a 6 digit alphanumeric display (Model 1099) especially designed for use in the chemical processing industry. Each indicator box may be mounted up to 200 feet (61 meters) away. Both the 1020 and 1099 indicators are CSA approved in the USA and Canada. Specialists in designing and manufacturing corrosion resistant scales for over 29+ years, Scaletron has designed the Model 4042-63 IBC-WE scale for use in harsh environments. The rugged steel construction of the scale base is protected by a corrosion resistant finish. The scale may be used for accurate weighing of a variety of materials including alum, ammonia, caustic, fluoride, phosphate, polymers, sodium aluminate, sodium bisulfate, sodium hydroxide, sodium hypochlorite and other liquids or powders. Scaletron Industries, Ltd. is the industry leader in corrosion resistance technology for scales used in the harsh environments of the municipal drinking water and wastewater treatment industry, as well as for use in industrial water and wastewater treatment. Scaletron Industries has been manufacturing electronic base scales since 1983 and manufactures a full line of electronic scales including cylinder, ton cylinder, drum, tank, platform, and spill containment, for use in many different applications that offer a high degree of accuracy to 0.1%. Scaletron also manufactures other mechanical and electronic scales for weighing chemicals commonly used in the water treatment industry including chlorine, sulfur dioxide, ammonia, hydrogen chloride, carbon dioxide, and other liquid or liquefied gas. 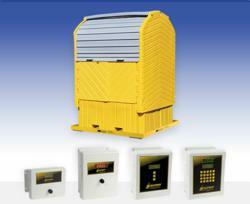 Scaletron offers a full, 5-year warranty on all products.